Chef Pete is an Australian seafood chef, author and TV personality based in Melbourne, Australia. He trained as a Chef in the Royal Australian Navy before running one of Australia’s premier members-only club kitchens at the RACV City Club. 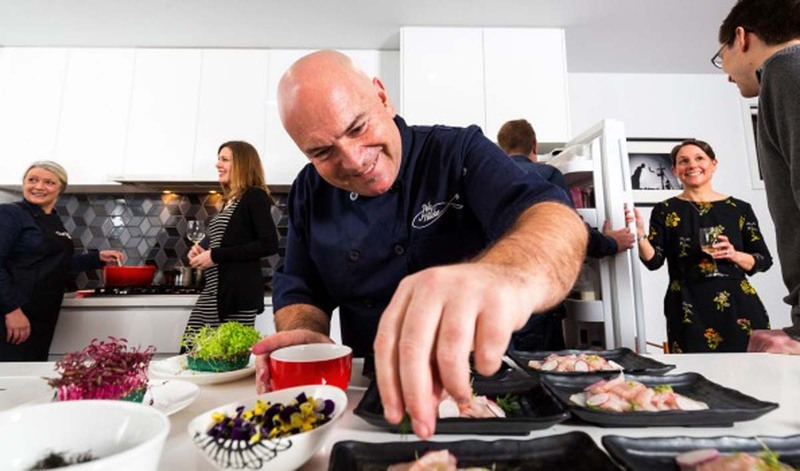 Since his Australian TV Debut on The Australian Seafood Show, he continues his role as The Sustainable Seafood Chef presenting in some shows across Foxtel & Radio, most recently Food To Eat on Footprint TV (USA). His goal in life is to educate people through his cooking. He wants to teach people how we can make sustainable seafood into something great when sourced and cooking right. From the look, taste and smell, the best, freshest ingredients were used. A large amount of thought has gone into his menu selections, which combined with a bit or pre-dinner prep means you get great food in good time with plenty of good conversation. We enjoyed the experience and food that Pete and Intertain provided. We were also very impressed that the kitchen was left so tidy. The food was fantastic but I would prefer a little bit more. I finished up almost satisfied but wishing for a little bit more. So far so good. Keep going! It went very well indeed. Pete delivered exactly as promised and was an engaging but not intrusive presence. What a way to entertain! Very happy with the service and the standards. I expect that Robert will be a return customer. This is an excellent addition to the hospitality industry – best wishes for a flourishing future. He's exceptionally knowledgeable on all things seafood, and the food industry in general. It was great sitting at our kitchen bench chatting with Pete as we sipped wine and watched him prepare our entree. It was fabulous. We all loved it, thank you. Beautiful presentation too, Pete. We had an amazing experience, the chef left me the rest of the dill as he promised, fresh ingredients and great presentation. Did not need to go to kitchen even once and that made us enjoy the company of our friends. A great concept, after we shared with our friends, they are all interested to try this concept. Thank you! Seafood Extraordinaire, Pete Hilcke will provide the best seafood culinary experience for you and your guests. The listed menu price of $138pp is based on a 3-course menu for a minimum of 6 guests. Experience the best of Chef Pete's dishes that take you on and your guests on a journey from the depth of the sea to the land. The listed menu price of $138pp is based on a set 5-courses for a minimum of 6 guests. Chef Pete will work with you to create the perfect menu to meet your dietary and budget preferences for your occasion. Price will be determined after the first consultation.